Last edited by dwdyer; 01-18-2010 at 10:30 AM. I've had much worse service than SA... and much better. They tried to pull the bad gas when my HPFP blew as well as a variety of other ticky tack issues, but on the other hand, they eventually followed through and resolved all issues I've faced. But I'd love to be able to not commit half a day just to do annual service. BTW, I asked SignHere for a status update and it seems everything is still on track for a March 1st opening. It was 2/1/2010...just keeps creeping out there. March 1st? Just went by yesterday and it doesn't look that close. Hate to be a cynic, but each year we've been told "6 months away". Should we place bets and see who guesses the actual opening date? Yay! 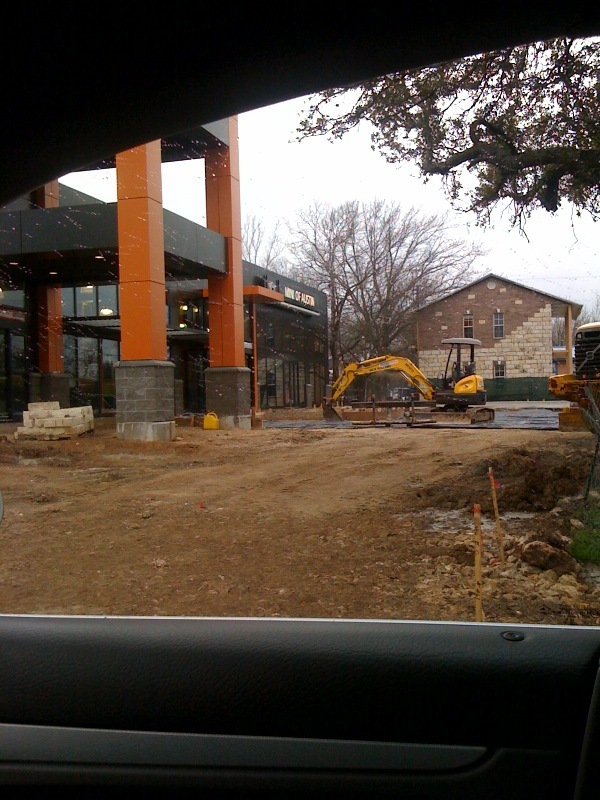 So hopefully by the time I finally find a job in Austin (a girl's got to dream) the dealership will be open. Either way, it'll be nice to have one there when I hopefully return for grad school. I really miss Austin! Hi everyone! They are working all sorts of crazy hours over there trying to get this place open! It will be open during the first week of March I am told. NOW CAN SOMEONE PLEASE STOP THIS RAIN?!?!?! ARRRRRRGH!!!!! Oh, and just as an aside...there will be some HUGE special incentives for the first 100 MINI buyers. But you didn't hear it from me! ;-) You might want to follow my tweets or Facebook page for the latest details - Both can be found under "MINI of Austin". And yes, those who reserve and order cars now will qualify for the soon-to-be-announced programs! Called Friday and they said they were trying to open on March 15th or 20th. Drove by today and snapped a couple of pics with my cell phone. I sure do appreciate a good weather day! We are getting close! I am looking forward to starting the "move that bus, move that bus" chant! I'm confidant this MINI dealership will be one of the best in the nation. I've been to other dealers and all seem to be just a slapped together afterthought "oh, I guess we should sell some MINIs... let's put it in this decrepit back corner." 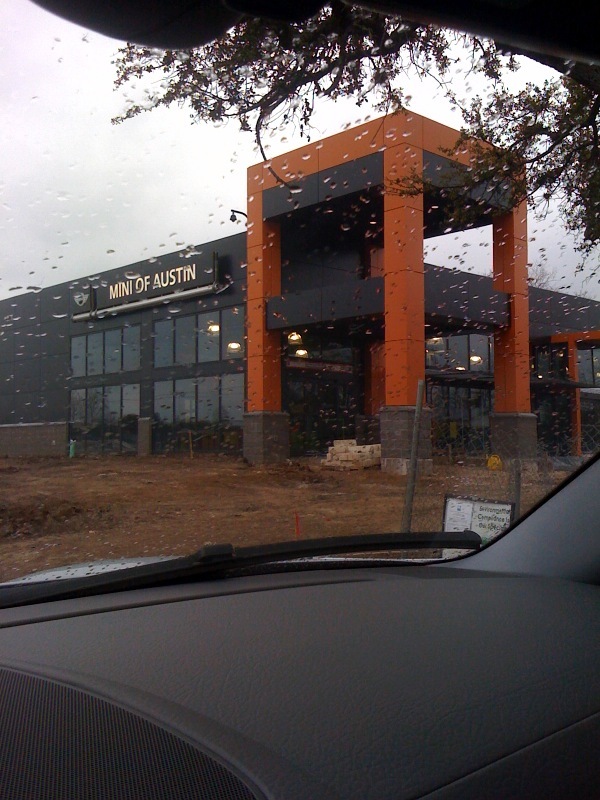 MINI of Austin already looks like 2 notches above the rest and they haven't even opened yet. BMW of Austin was the best. I'd expect no less from MINI of Austin. I tend to agree with everything you said. Hmmmm, I may swing by then. I have an interview in Dripping Springs on the 1st. Another excuse to head to Austin for the day! Bummer! Oh well, I may still try to do a drive-by this week. I'm crossing my fingers that this will be the job! I really want to move back to Austin.